the right. Was this the first "strip mall?" We present part 3 of the digitalized photos of the Underwood & Underwood stereoscope collection, Palestine through the Stereoscope, from Emory University's Pitts Theology Library, Candler School of Theology. In this feature we present the pictures of Jerusalem's walls and gates. By comparing the photos to the photo essays presented here over the last two years we are able to date the pictures. 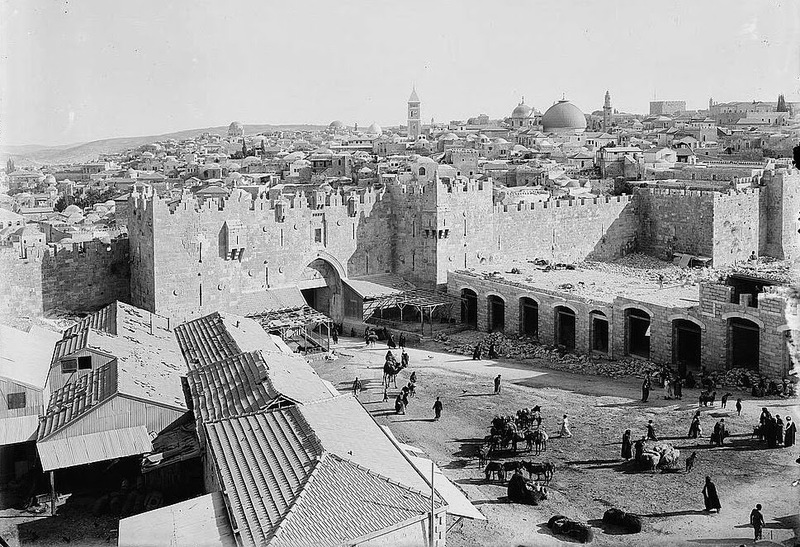 Damascus Gate 1: The shops on the right of the square belonged to a Jewish banker name Chaim Aharon Valero (circa 1905). The domes of the Hurva and Tiferet Yisrael synagogues are on the horizon on the left of the picture. Both were destroyed by the Jordanian Legion in 1948. Read more about Valero here. Damascus Gate 2. photographed by Mendel Diness. 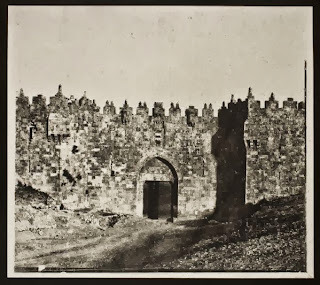 Damascus Gate 2: Mendel Diness, a Jewish watchmaker, became Jerusalem's first Jewish photographer and is credited with photographing the Damascus Gate in the 1850s. Later he left Palestine and became a Christian preacher in the United States named Mendenhall John Dennis. Read more about Diness/Dennis and his photo collection found in a Minnesota garage sale. Valero's shops outside the gate. 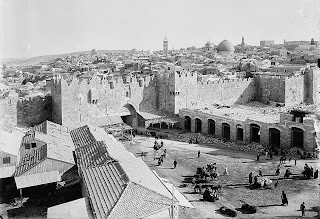 Damascus Gate 3: The picture shows the construction of Valero's shops. In the 1930s, the British authorities ruled that the area should be zoned for use as "open spaces" and they demolished the shops in 1937. The Valeros were not compensated. View pictures of the demolition here. I love the Israel Daily Picture ... it connects me with my history and the history of my people. It is fascinating, creative, insightful, exciting -- and does it from original source photographs.